ST. THOMAS, USVI (CBS USVI) — It is a first of its’ kind event that is bringing several federal agencies into one place. People in the area can come out to meet them face to face. A few of the groups CBS USVI spoke with said it was a great way to get involved in the community. That’s really what it is being called, a community event or a one stop shop for those federal agencies and be in St. Thomas on Thursday. There are groups here from the US Custom and Border Protection Agency to the SBA to the Federal Bureau of Investigations. There is also the Virgin Islands Housing and Finance Authority, USDA, and Project Safe Neighborhoods. “I think it is a great opportunity that I hope the public will take advantage of because we’re here and we’re giving free information. You don’t have to come into the office,” Lorelie Conner with the U.S. Citizenship and Immigration Services said. 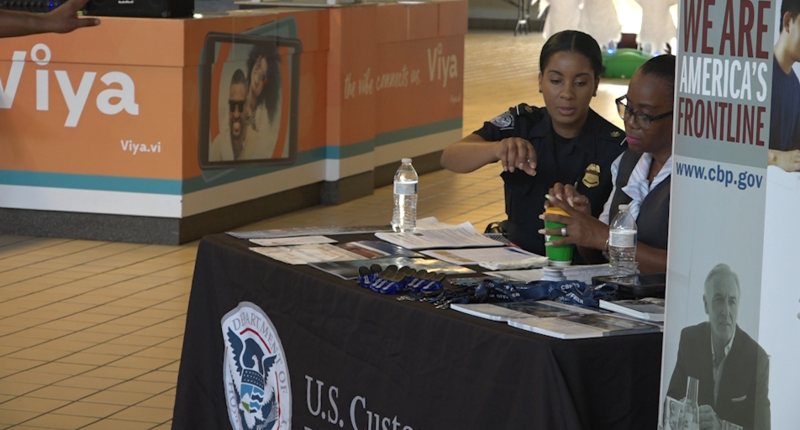 “For me I am excited to be here coming out of San Juan to be in St. Thomas gives us an opportunity to show the community what we have regarding public safety and the different programs that we have outreach programs for the community,” Diana Rosa with the FBI San Juan Field Office said. “What happens often times and people are still able to do it you come into our office you have to fill out forms for us to be able to speak on your behalf then we interface then we come back with you. This way bring your documents and the person is right there in front of you,” Rep. Stacey Plaskett who helped sponsor the event said. If you missed the community event Thursday, organizers said they hope to have more of them in the future.